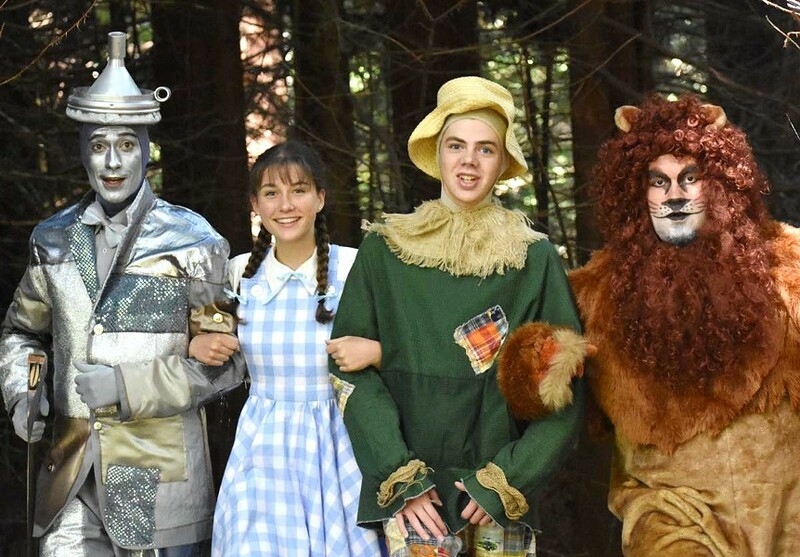 Submitted James Gadd, Hannah Davis, Ty Vizenor and Tristan Roberts hit the Yellow Brick Road for HLOC. Director Victor Fleming's 1939 film adaptation of The Wizard of Oz, when one thinks about it, may be the most famous ever made. Its characters, lyrics and even throwaway lines have endured as iconic for eight decades, entered the global lexicon and, in some cases, even become rather tired clichés. It's possible modern audiences don't even know that the story is taken from a turn-of-the-20th century children's book by L. Frank Baum. Long since fallen out of copyright, the story has been adapted into a myriad of theatrical versions. The one now being staged by the Humboldt Light Opera Company isn't a crack at the West End musical version by Andrew Lloyd Webber a few years back but the adaptation done by the Royal Shakespeare Company in 1987. And this version is a pretty straight-ahead telling of the story from the film, complete with the songs known to all and others you may remember less well. It's a roaring success in its scale, cast and technical proficiency. HLOC's past two big summer productions, Ruddigore and Phantom of the Country Opera, were adequate but not rousing wins. But The Wizard of Oz, under the sharp direction of HLOC vet and current artistic producing director Carol McWhorter Ryder, succeeds where those fell short. Having a space as large and acoustically dynamic as Humboldt State University's Van Duzer Theatre is certainly a built-in advantage for such an ambitious staging, with a cast of more than 80 people and many technical challenges. Characters fly on wires more than 20 feet off the stage at times and the challenges of set decoration and special effects are pulled off impressively. Should any of you for some bewildering reason need a primer on the basics here, our story begins in Depression-era Kansas. Young girl Dorothy (Hannah Davis, outstanding in the lead and with a great voice) is being raised by her Uncle Henry (Barry Priestly) and Auntie Em (Shaelan Salas Rich) on their farm. Starting to sound familiar? There's also the matter of Dorothy being harangued by meddlesome and haughty neighbor Miss Gultch, almost entirely over the matter of Dorothy's beloved small dog, Toto. Canines are notoriously difficult to control onstage and overly excited by musical numbers, but the solution this show comes up with for Toto's part is too good to share here. And no, it's not someone in a dog suit. It may be somewhat odd that what's considered the movie's trademark song, "Somewhere Over the Rainbow," appears first, just as in the movie — not at all the opening number that might logically kick off a musical tale. But Davis' rendition is amazing and she does a brief reprise of it later in the play (the reprise was filmed for the movie but didn't make the final cut). As the movie makes the shift from Kansas to Oz, the eye-popping production numbers play just as well as they did in the flatter visual medium of film, and Ryder and the huge all-ages cast do great work with the Munchkinland number, just as with the massive logistics of the "Merry Old Land of Oz" number in the second act. As Gilda, aka the Good Witch of the South, Fiona Gadd Ryder (Ruddigore) possesses an awesome voice and range, and does well with a relatively smaller role as she quite literally often floats in and out of the action. 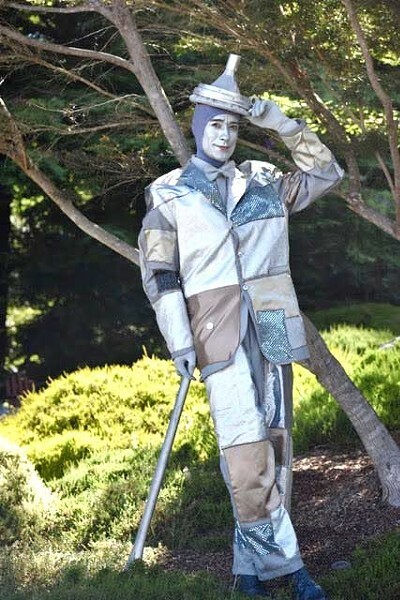 As the story moves along, we meet the Scarecrow (Ty Vizenor), the Tinman (James Gadd, a wicked tap dancer) and Tristan Roberts as the Lion, who brings just enough, and maybe really eventually too much, hamming up to the role. Along with Wicked Witch Katri Pitts (HLOC's Cinderella), they get some great comic bits that haven't all aged perfectly in 80 years but work well overall. And enough cannot be said about the technical credits, from both the design of the sets to the superb costume design by Carol Ryder, Liz Sousa and Kevin Sharkey. The flight choreography by Lewie Long, with an assist from flight captain Carl McGahan and his crew, flawlessly sends people soaring and gliding up high and landing safely. The Wizard of Oz comes nicely to life onstage and steps loose from being just an iconic film. Creative touches here — including talking trees, poppies in human form and hovering singers dressed in crow costumes — aren't things you can get in the movie. Plus you get the satisfaction of seeing the Wicked Witch railing at her minions about their damned repetitive chant. The Humboldt Light Opera's production of The Wizard of Oz plays at the Van Duzer Theatre on the HSU campus on Fridays and Saturdays at 7:30 p.m. through Aug. 18, with Sunday matinees at 2 p.m. on Aug. 12 and Aug. 19. For more information, call (707) 630-5013 or visit www.hloc.org. Mother of dragons, the curtains close after the Sunday, Aug. 12 2 p.m. matinee of the free Plays in the Park production of The Legend of Young Merlin in Redwood Park.